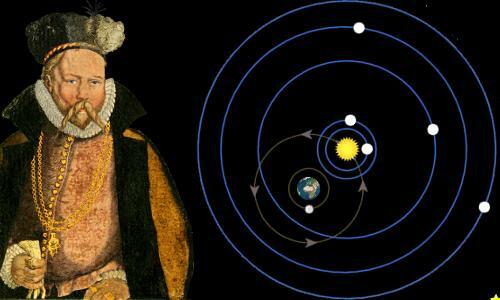 Tycho Brahe was a larger than life aristocratic astronomer whose observations became the foundation for a new understanding of the solar system and ultimately gravity. Brought up by an uncle who had kidnapped him, Tycho defied both his natural and foster parents to become a scientist rather than a nobleman at the Royal Court. Never one to refuse liquor or back down in an argument, as a young man he lost most of his nose in a duel. He continued to argue vehemently with a variety of foes for the rest of his life. In addition to being an extraordinary character, Tycho was a brilliant astronomer, whose work was substantially more accurate than his peers. His lunar theory was the best ever devised, and he produced data for the best star catalog that had ever been compiled. His outstandingly rigorous observations enabled his one-time assistant Johannes Kepler to discover that planets move around the sun in elliptical orbits. 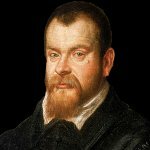 Tycho Ottesen Brahe was born into a highly aristocratic, very wealthy family on December 14, 1546. He was born in his parents’ large manor house at Knutstorp, in the Danish region of Scarnia, which is now in Sweden. Tycho’s father was Otte Brahe, a member of the Royal Court. His mother was Beate Bille, also an important aristocrat. Tycho was the second of the couple’s 12 children. Something rather remarkable happened to Tycho in his second year of life – he was kidnapped by his uncle and aunt, Jørgen Brahe and Inger Oxe, when his parents were away from home. Tycho’s uncle and aunt were childless, and they believed that Jørgen was entitled to a lawful son and heir to his estates. Tycho’s natural parents eventually agreed to this, so Tycho was raised by his uncle and aunt as if he were their own son. The Brahe family was powerful and militaristic. By tradition their male children became warriors serving the interests of the family, the King, and the Danish nobility. However, Tycho’s foster mother, Inger, had come from an academic family and she persuaded her husband that Tycho should receive an academic education. Tycho began school aged six or seven, a grammar school where he probably learned the classical languages, mathematics, and the Lutheran religion. 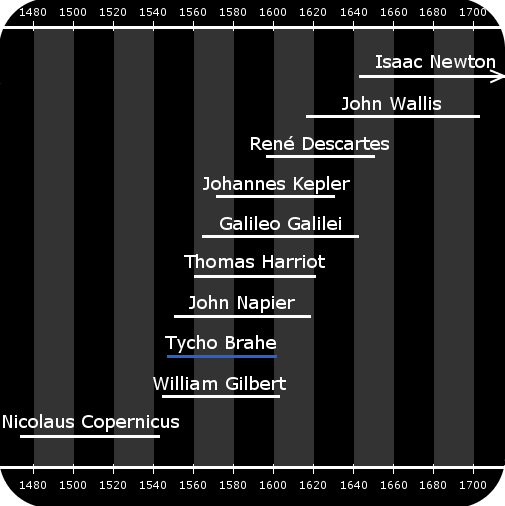 Brahe’s lifetime and the lifetimes of related scientists and mathematicians. In April 1559, aged 12, Tycho matriculated at the University of Copenhagen. He studied a general classical curriculum for three years, during which time he became increasingly absorbed in astronomy. He bought a number of important books in the field, including Johannes de Sacrobosco’s On the Spheres, Peter Abian’s Cosmography, and Regiomantus’s Trigonometry. Tycho’s interest in astronomy began with the solar eclipse of August 21, 1560. In Copenhagen this eclipse was barely noticeable – less than half of the sun was covered. The eclipse inspired Tycho not because it was spectacular, but because astronomers had predicted exactly when it would happen. Tycho was fascinated, and wanted to learn how he too could make predictions like this. Astronomy was actually an excellent fit for Tycho’s mathematical skills and his eye for detail. 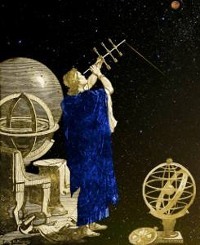 The second century BC astronomer Hipparchus makes observations. In the 1560s astronomers still used similar equipment. In March 1562, aged 15, Tycho matriculated at the University of Leipzig in Germany, where again he followed a classical curriculum. He was supervised at Leipzig by Anders Vedel, a well-educated, twenty-year-old Dane. Vedel was appointed by Tycho’s foster parents, who had decided Tycho’s future career would be as a legal advisor at the Royal Court. Vedel was tasked with keeping the rather headstrong Tycho on the straight and narrow, but he did not succeed. Tycho secretly continued to devote as much time as he could to astronomy. Using just a basic, fist-sized celestial sphere and string, Tycho discovered that tables of predictions of planet positions sourced from the works of both Ptolemy and Nicolaus Copernicus were rather unsatisfactory. In August 1563, aged 16, Tycho began his first logbook of astronomical observations. 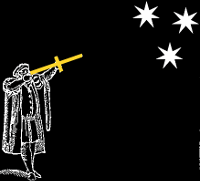 An astronomer in the 1500s makes observations using a cross staff. He observed a one-in-twenty-year conjunction of Jupiter and Saturn, and again noted errors in both Copernicus’s and Ptolemy’s predictions. Using Ptolemy’s data tables, the conjunction timing was wrong by a month! It became Tycho’s goal to produce truly accurate predictions of planetary positions based on accurate observations. In April 1564, aged 17, Tycho bought a cross staff to make his observations. The cross staff was so large that his supervisor must have been aware Tycho was devoting time to astronomy. Tycho did not care – there was no need for secrecy any more. He had decided that astronomy would be his life’s work. In the summer of 1565, Tycho returned to Denmark, where his step-father Jørgen had been in the process of making Tycho his legal heir. Unfortunately for Jørgen and Tycho, a war with Sweden intervened. Jørgen was appointed Vice Admiral of the Danish Fleet and died of pneumonia in the summer of 1565 after falling into the water. Tycho inherited nothing, because the paperwork making him Jørgen’s legal heir was incomplete. The law said that everything went in trust to his foster-mother. When she died Jørgen’s estates were to be distributed among the whole Brahe family. In April 1566, aged 19, Tycho arrived back in Germany. On a December evening he got into argument with another Danish student who, like him, was studying at the University of Rostock. The cause of the argument is not known. Sometimes it’s claimed they were arguing about which of them was the better mathematician, but this is probably a myth. No doubt alcohol played a part in the dispute – Tycho enjoyed dining and drinking heartily. After further disagreements, the two students fought a duel with swords, which resulted in Tycho losing the front of his nose and picking up a permanent scar on his forehead. A year later, he returned to Denmark, where he began experimenting with metal fittings to disguise his nose’s disfigurement. He wore a skin-colored metal prosthetic for the rest of his life. At the end of 1567, Tycho left Denmark again for a tour of Germany and Switzerland. He was now 21. In spring 1569, he arrived in Augsburg, where he spent 14 months learning how to make high-precision astronomical instruments. His ambition was to build instruments allowing him to make observations true to within one arc minute (one-sixtieth of a degree). The first instruments designed by Tycho Brahe in Augsburg. 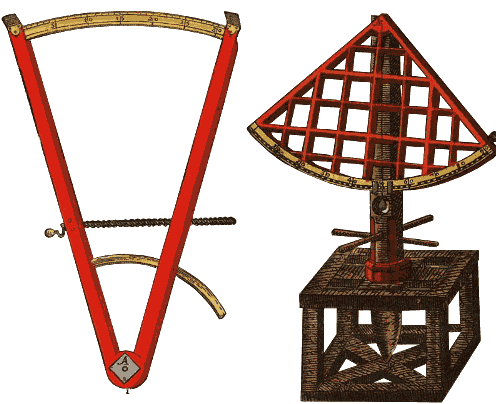 On the left, an instrument to measure the angle between heavenly bodies. On the right an enormous quadrant whose radius was 5.5 meters. When news reached him that his natural father, Otte Brahe, was ailing, Tycho returned to Denmark. His father died in May 1571, leaving 23-year-old Tycho a substantial legacy. Galileo Galilei studied the heavens with a telescope for the first time in 1609. Sadly, Tycho did not live long enough to see this. All his observations were made with the naked eye, using the finest astronomical instruments in Europe. Although he did not quite succeed in his ambition to make all his measurements accurate to with one arc minute, many of them did meet this standard, and his observations were a phenomenal five times more accurate than his peers made. Tycho made his first significant discovery on November 11, 1572. Observing the night sky from an uncle’s home, Tycho was amazed to see a new light brighter than Venus in the sky. He studied the new heavenly body for a year. He deduced that it was a star because, unlike closer bodies such as the planets, its position relative to the other stars did not change. In 1573, Tycho’s name became well-known in astronomical circles when he published De nova stella – The New Star. Although other people had also observed the new star, Tycho published the most comprehensive study of it. Tycho’s new star gradually faded until, after a year, it was no longer visible to the naked eye. The Latin word nova is still used for stars that suddenly get brighter. We now know that Tycho’s new star was actually a supernova. Tycho’s observation of the new star, showing its location compared with other named stars. On the right is a modern X-ray image of the remnants of Tycho’s supernova, cataloged as SN 1572. Tycho’s discovery was another nail in the coffin for Aristotle’s world view that the heavens beyond the moon are perfect and unchanging. Hipparchus had previously refuted Aristotle’s view with his observation of a new star in 134 BC. Tycho’s sketch of the comet orbiting the sun. The comet’s tail points away from the sun. The Great Comet of 1577 made people fearful, because comets were seen as bad omens. Tycho recorded the comet’s positions between November 13, 1577 and January 26, 1578, after which he could no longer see it. Tycho used Hipparchus’s parallax method to measure the comet’s distance from the earth. The comet was much farther away from our planet than the moon is – at least six times as far. This refuted the popular idea that comets traveled within the earth’s atmosphere. The comet’s tail always pointed away from the sun. 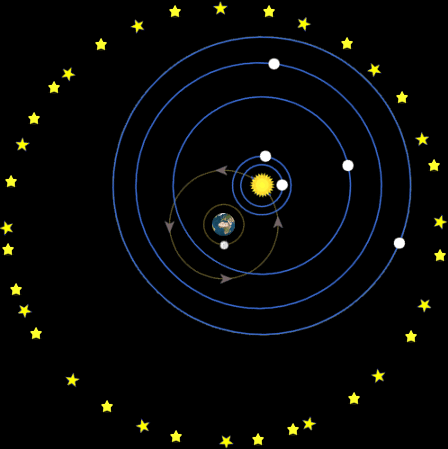 The comet’s path was associated with the sun, not the earth. As was customary, Tycho wrote to the King with astrological predictions based on the comet’s appearance. He followed the usual line that the comet was a sign of bad things to come. Unusually for the time, however, his recommendations did not focus on the supernatural. He told the King that the comet’s negative effects could be moderated if suitable policies were used in governance and if people used their free will in a levelheaded way. The comet had another far-reaching consequence for Tycho and science. It prompted him to begin making observations with a view to producing his own star catalogue to replace Ptolemy’s ancient work. Tycho accurately recorded the positions of 777 stars by 1592, and he eventually amassed data for 1,006 stars. Tycho’s catalog was later worked on and published by Johannes Kepler. The King wished to reward Tycho for some diplomatic work he had performed and awarded him the 3 square mile (7.5 sq. km) Danish island of Hven. On this island, in about 1580, Tycho completed the construction of Uraniborg, a palace-observatory, named after Urania, the Muse of Astronomy. 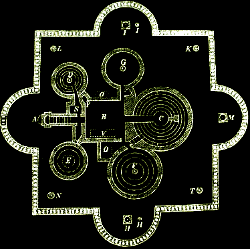 Plan of Stjerneborg showing the underground observing chambers. Tycho’s island was rather windy and he realized he could never make highly precise astronomical measurements unless he had perfect stillness. He decided to build an underground observatory, which he completed in 1581. Tycho called his underground observatory Stjerneborg, meaning Star Castle. Tycho now carried out research on a scale few other astronomers could match. He was the wealthiest scientist in Europe and his work at Uraniborg was also generously supported by the King. He employed skilled workers to build him the very finest astronomical instruments, and he attracted flocks of students eager to become disciples in the astronomical temples of Uraniborg and Stjerneborg. Michael Maestlin, the German astronomer who became Johannes Kepler’s teacher, had also observed the 1577 comet. Although his instruments were less sophisticated that Tycho’s, he had analyzed the comet’s movement in greater detail than Tycho. Where Tycho said the comet was a least 6 times farther away than the moon, Maestlin had calculated the comet’s daily distance from the earth. Maestlin asserted that the comet had moved from about 3 times farther away than the moon to 30 times farther away than the moon. This implied that the comet must have traveled through the ‘crystal spheres’ of Mercury and Venus. Since Aristotle’s time, people believed planets were held in orbit around the earth by concentric ‘heavenly spheres.’ In Tycho’s time these spheres were imagined to be hard, clear, and crystalline. In 1586, Cristoph Rothmann wrote Tycho pointing out that comets’ paths carried them through the crystal spheres. Tycho was stunned by the thought that comets could break through the crystal spheres. Could it be that the spheres did not exist? Other scientists had also questioned the substance of the heavenly spheres. Jean Pena in Paris, for example, had rejected them in 1557 based on light refraction. If the heavenly spheres were not real, then what did the universe really look like? Tycho was familiar with the concepts of the earth-centered solar system and the sun-centered solar system. The mathematics for these systems had been presented by Ptolemy and Copernicus respectively. Tycho was dissatisfied with their efforts – even as a 15-year-old he saw flaws in the planet positions predicted by their models. He also thought the earth was simply too heavy to fly at an enormous speed through the heavens as Copernicus’s system suggested. Tycho tried to produce a model consistent with the best of both Ptolemy and Copernicus. He said that Copernicus was right – the five planets Mercury, Venus, Mars, Jupiter and Saturn – do orbit the sun. However, the moon, the sun and the stars orbit the earth, as Ptolemy had said. The Tychonic System. Earth is at the center of the universe. The moon, the sun, and the stars orbit the earth. The five planets orbit the sun. Although to modern minds discarding the crystal spheres may seem trivial, in Tycho’s times it was revolutionary. 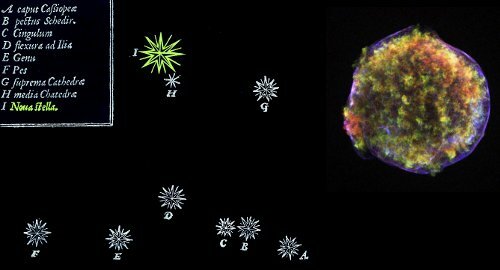 Tycho removed a major obstacle to our understanding of the universe, because if there were no crystal spheres, something else must hold the heavenly bodies in their orbits. In 1588, Tycho published details of his system and his great comet observations in a book entitled De Mundi Aetherei Recentioribus Phaenomenis Liber Secundus (The Second Book About Recent Phenomena in the Celestial World). Often the book is called simply De Mundi. The book and Tycho’s system were popular. Unlike the works of Copernicus and Galileo, Tycho’s works were not later banned by the Catholic Church. When Galileo claimed his discovery of Venus’s phases proved Copernicus was right, the Church pointed out that his discovery was also consistent with Tycho’s earth-centered universe. The moon’s movements are fiendishly difficult to understand mathematically. Differences between the moon’s true behavior versus its predicted behavior had been a thorn in the side of astronomers for thousands of years. Tycho’s lunar theory was a tremendous success, reducing the variations between theory and observed to one-fifth of those from Ptolemy’s theory. In one of his most brilliant pieces of work, in 1595 Tycho discovered the variation of the Moon’s longitude, and that the moon’s oscillations on its orbital plane relative to the ecliptic are not a constant 5 degrees, but vary between 5 and 5¼ degrees. From this, he was able to reason, correctly, that there are oscillations in the longitude of the lunar nodes. In 1597, Tycho left Uraniborg and Denmark forever after major disagreements with Denmark’s King. He spent some time in Germany until, in 1599, Holy Roman Emperor Rudolph II invited him to become his imperial mathematician. Tycho accepted a manor house in Benatek, which today is situated in the Czech Republic. He worked there for a year, then Rudolph summoned him to live in Prague, where he valued Tycho’s horoscopes. Tycho left Uraniborg with a precious cargo – almost two decades worth of accurate observations of the stars and planets he and his many research workers made there. In Prague, Tycho gave Johannes Kepler a job as his assistant. Together, they began working on a new star catalog, but it was slow work. The catalog was eventually published by Kepler in 1627 as the Rudolphine Tables. These were by far the most accurate astronomical data tables ever published, with planetary data and 1,006 star positions. The majority of stars were cataloged to within one arc minute accuracy, which had been Tycho’s ambition. Kepler had absolute faith in Tycho’s data. He also had absolute faith that Copernicus was right about a sun-centered solar system. He also had absolute faith that the planets’ orbits were based on the circle, as both Copernicus and Ptolemy had believed. When he found he could not fit Tycho’s data to Copernicus’s or Ptolemy’s mathematical models of planetary movements, he did not lose his faith in Tycho’s data. He concluded that he must be mistaken about another of his articles of faith. Kepler abandoned the circle rather than believe Tycho’s observations were wrong. Without Tycho’s data – particularly his superlative records of the positions of Mars – Kepler could not have made his great discoveries of the laws of planetary motion. 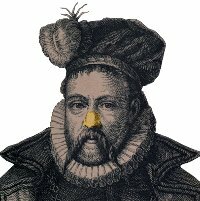 Tycho Brahe could be high-handed in his dealings with people. The farmers on the island of Hven objected to the fact he made them work much harder than they were accustomed to. At Uraniborg, the turnover of research workers was high, probably because many of the workers found Tycho difficult to work with. Some also came as spies. For example, Nicholas Baer, known as Ursus, took details of Tycho’s instruments to a rival astronomer and also seems to have stolen Tycho’s new system for the solar system before it was fully formed. Tycho expelled Ursus from Uraniborg after Ursus was caught snooping among Tycho’s books. Funnily enough, in later life, Tycho replaced Urusus as Rudolph II’s imperial mathematician. At the age of 25, Tycho committed a serious social offense; he took a woman who was not born an aristocrat as his partner. It was illegal for the young couple to marry in the usual way. However, provided they lived together for three years, their partnership would be recognized as a legal marriage. They did this and became husband and wife. Tycho’s wife was Kirsten Hansen, daughter of a Lutheran minister. Tycho and Kirsten had eight children, six of whom survived to adulthood. The form of marriage between the couple meant their children were commoners, not entitled to enjoy any of the privileges of the nobility. Also, they could not inherit Tycho’s estates or his coat of arms. Following his exile from Denmark, Tycho and his family ended up in the court of Holy Roman Emperor Rudolph II. There Tycho’s wife and children were treated as nobles. On October 13, 1601, Tycho attended a banquet in Prague. As usual, he had plenty to drink, but the meal carried on for a long time. Although desperate to urinate, he did not leave the table – it would have been very impolite to leave the table before the meal was formally over. Tycho Brahe died aged 54 on October 24, 1601 in Prague. His premature death was probably caused by either a burst bladder or kidney failure resulting from an excessive amount of urea in his blood. A 2012 report following a forensic examination of Tycho’s remains said claims Tycho had been poisoned were unfounded. Tycho was buried with great honors in Prague’s Tyn Cathedral. "Tycho Brahe." Famous Scientists. famousscientists.org. 19 Sep. 2016. Web. Did Tycho Eliminate the Celestial Spheres Before 1586?